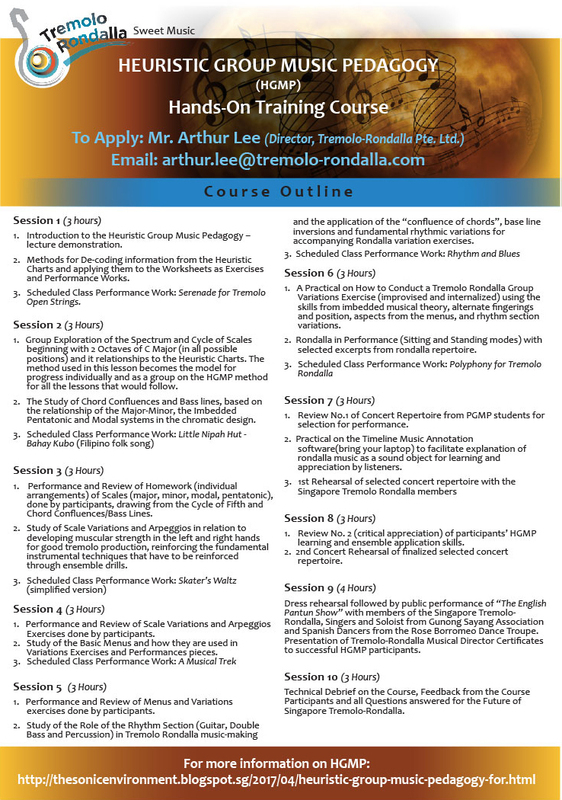 The Heuristic Group Music Pedagogy (HGMP) is an integrated approach for teaching and learning tremolo music (the 3rd pillar in string music with bowed and plucked strings. Tremolo is obtained by using a plectrum in a rapid up-down movement on the strings). 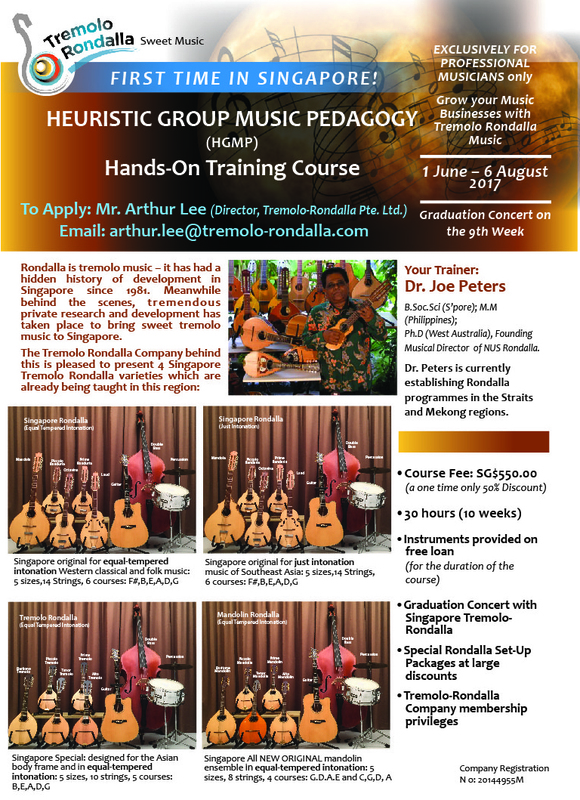 HGMP teaches how to train a Singapore Rondalla in a foco-unit (one to a part for five varieties of tremolo and a trio section of double bass, guitar and percussion). Performance is a fundamental objective right from the first lesson, and paced musical development for the individuals is a priority – achieved through creativity rather than prescription of training and performance materials. 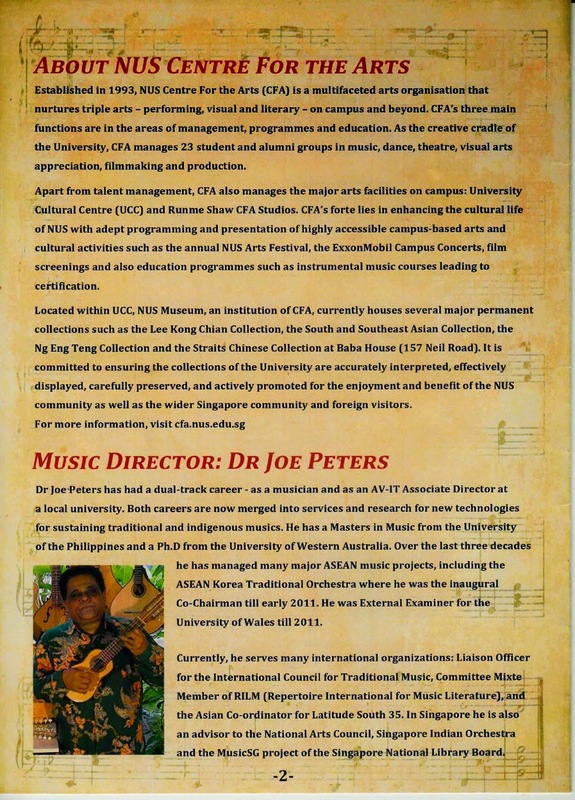 HGMP draws from a milieu of musical experiences and pedagogical applications, beginning in the 1960s through individualized violin lessons with his first violin teacher, Mr. Lenardo Reyes at the Far Eastern Music School, and then with Maestro Alfonso Anthony as a private violin tutor. 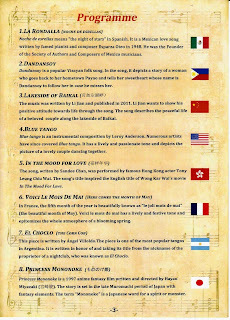 Violin training, based on the Associated Board of the Royal Schools of Musuci (ABRASM) was essentially a conservatory-influenced pedagogy. 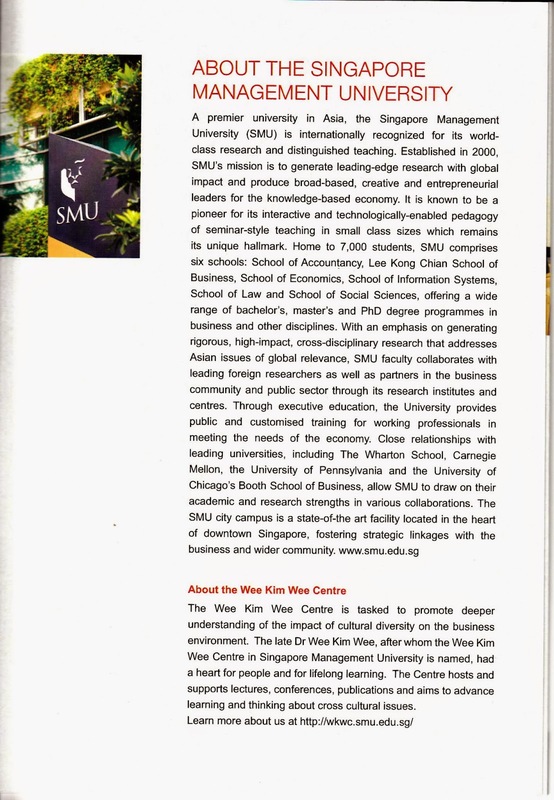 It contrasted to a parallel activity, which was self-improvised with a small group of band-boys at St. Joseph’s Institution, led by Mr. Vincent Undasan, which led to the creation of the first school marching military band in Singapore. These boys used music pedagogy they innocently termed the buddy system (learning today and teaching tomorrow, peer to peer), which forced them to create the music exercises as well as the repertoire for the band. Most of the boys involved in this activity eventually became professional musicians. Dr. Peters had his first brunt with heurism with this school activity. The next big “eye and ear opener” came in the 1970s while Dr. Peters was a graduate student at the University of the Philippines. 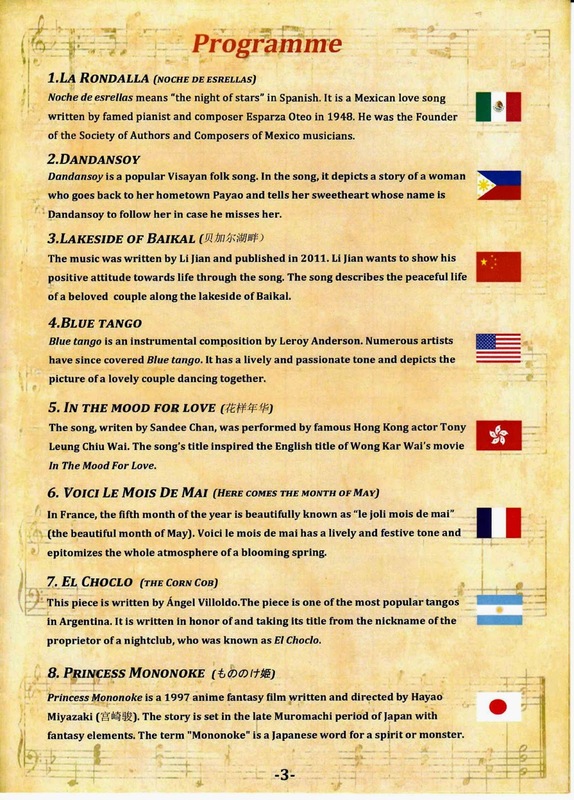 Here he came across (totally by chance) the unique group pedagogy used by the late Professor Rodolfo De Leon to teach a class of rondalla students. 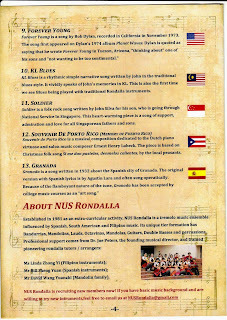 Fiesta Rondalla is the annual concert series of the NUS Rondalla. 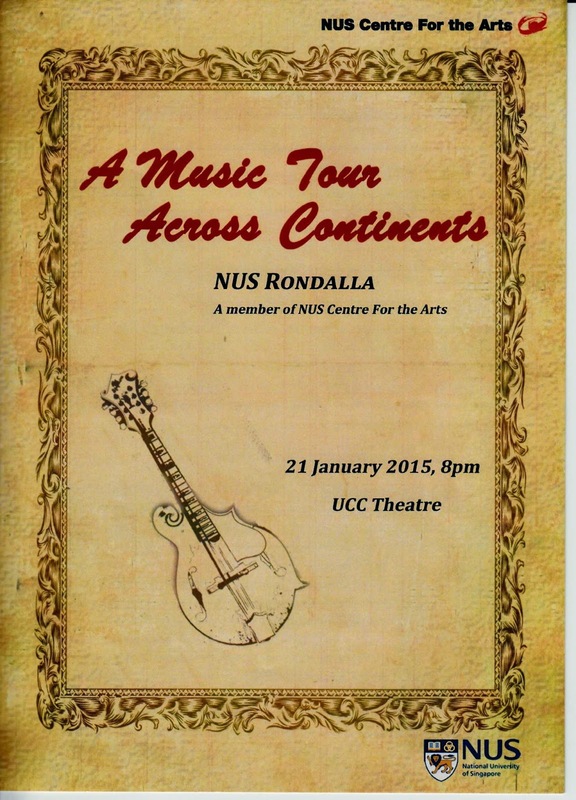 The latest concert held on 23 January 2015 featured a number of new arrangements by tutors. 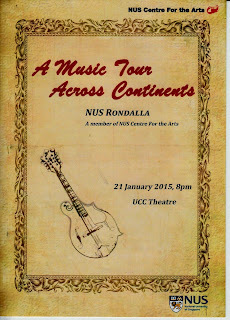 NUS Rondalla is an extra-curricular activity managed by the NUS Centre for the Arts. The activity is managed by 3 Tutors and 1 Musical Director. A student executive committee runs the day to day activity. 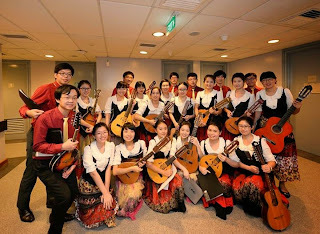 Each year new students have to be recruited and trained in one semester to perform Fiesta Rondalla. New students have to have music background. 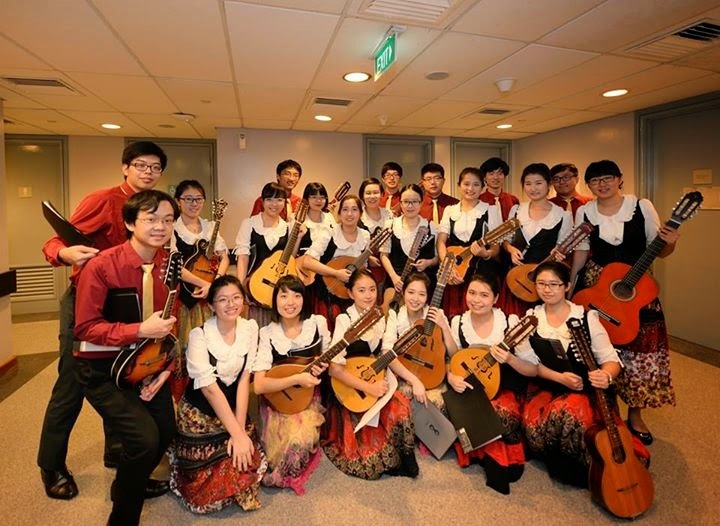 They are trained using a heuristic group music method and by the second semester a new rondalla is ready for work on the repertoire for the annual concert. 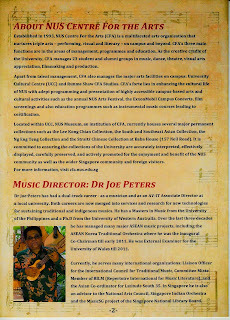 The Fiesta Programme this year featured John Silva as a special guest. 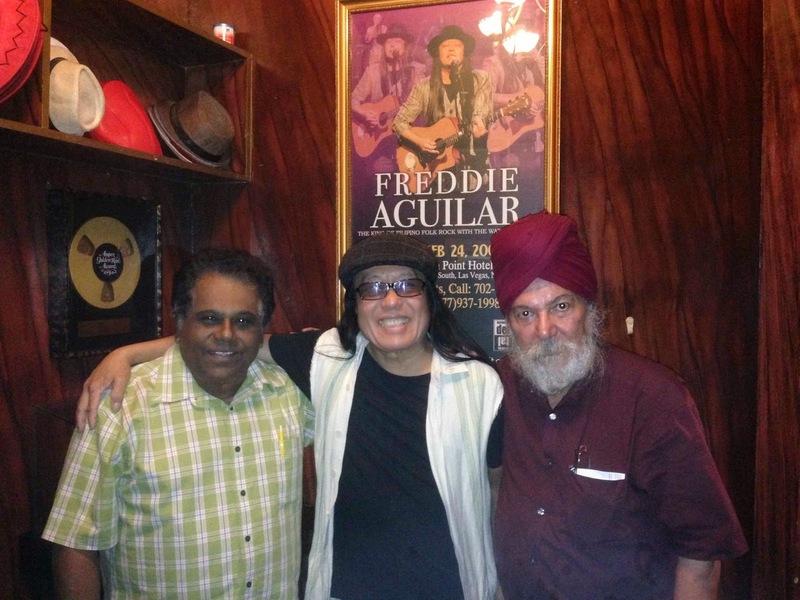 John is a Singapore "blues music" singer who leads his own band The Blues Express. He is also a prolific song writer. 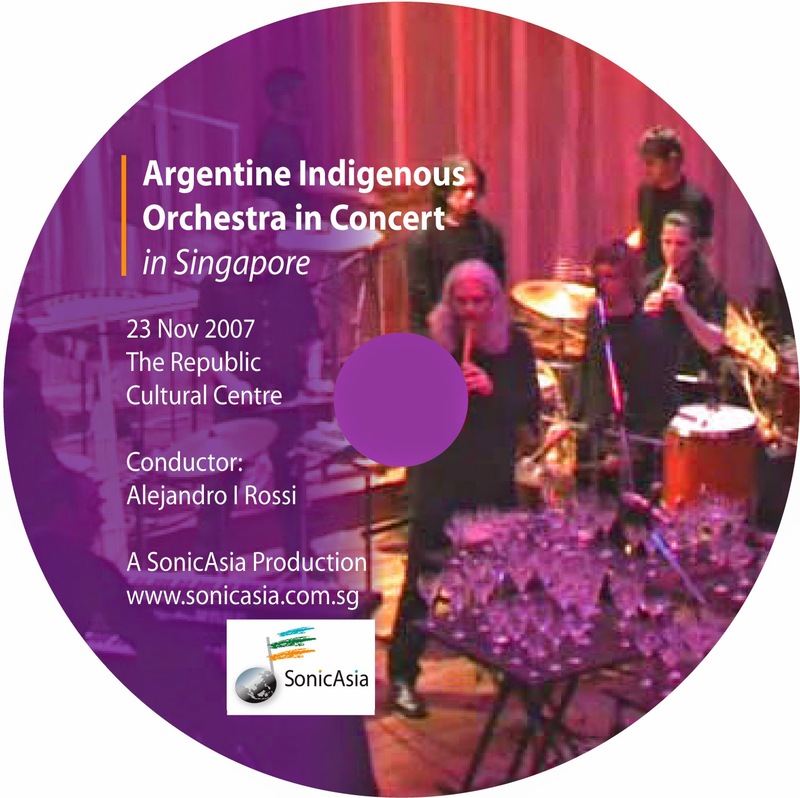 Two of his compositions will be featured with rondalla accompaniment: KL Blues and Soldier. 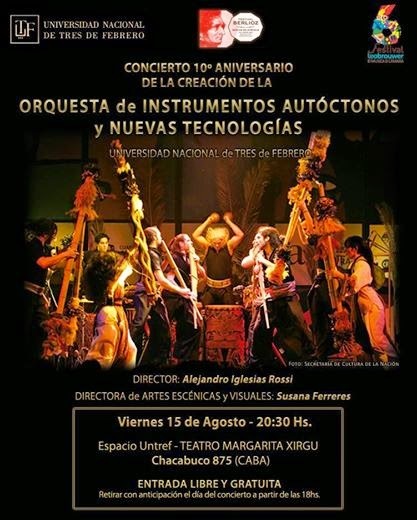 You can watch all the items of this concert on video at the links that appear below. All the videos are annotated with information on the screen. 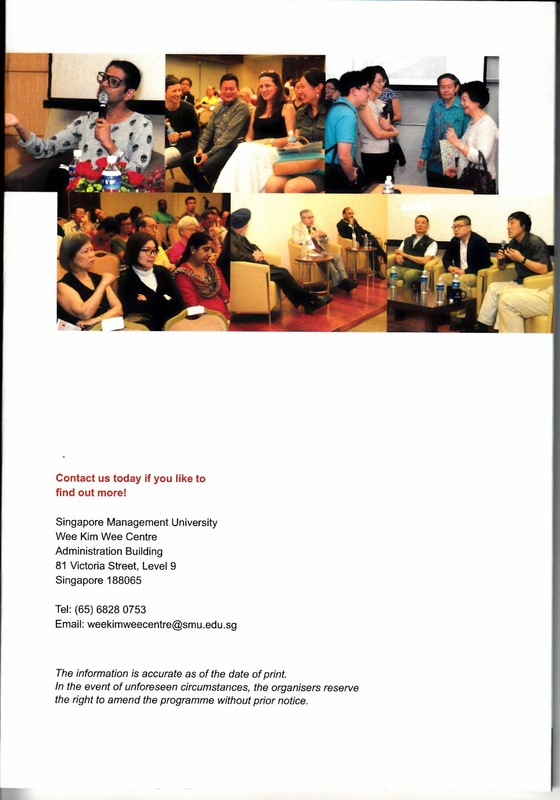 Anak - The Untold Story: Illustrated Lecture at the Singapore Management University under the Lien Fung's Colloquim! 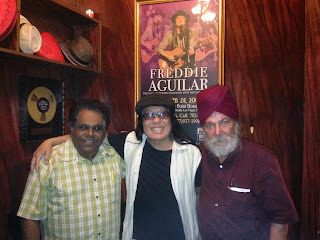 Kirpal Singh and I met Freddie at his new club Ka Freddie at Quezon City to convince him to come to Singapore and talk about the many untold details of his illustrious music career. 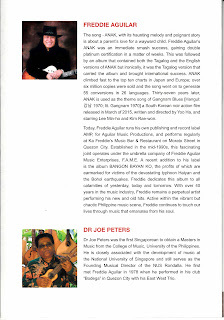 I met Freddie in 1978 while I was studying at the College of Music, University of the Philippines. My trio played in his club Bodega. Freddie Aguilar, the extraordinary Filipino musician who created the song Anak, a timeless folk song that sustained as an international hit since 1978, gave his illustrated talk on Anak- The Untold Story. 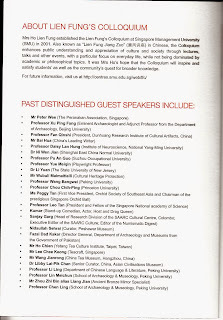 on 18 April 2015 at SMU. Freddie charmed the audience with his humour. With his Taylor guitar strapped to his body, as he told his story to an attentive and responsive audience. 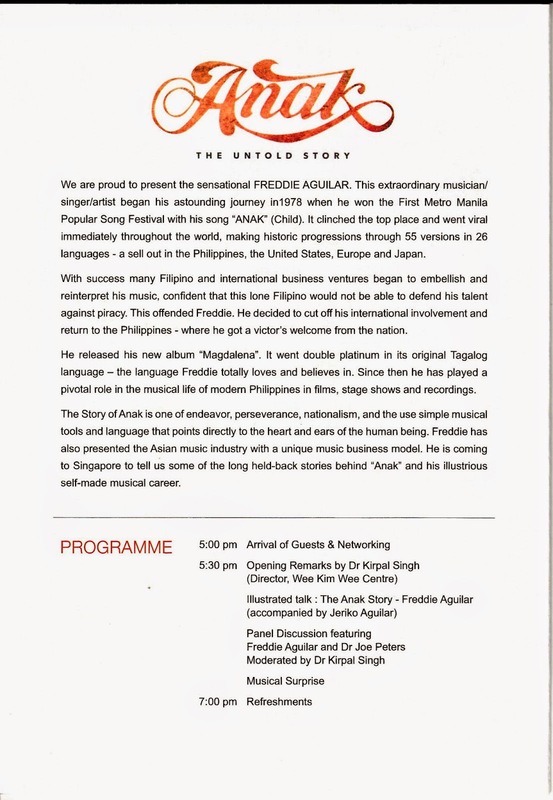 He ended his talk with a performance of Anak, accompanied by his son Jeriko and the Singapore Tremolo Rondalla. 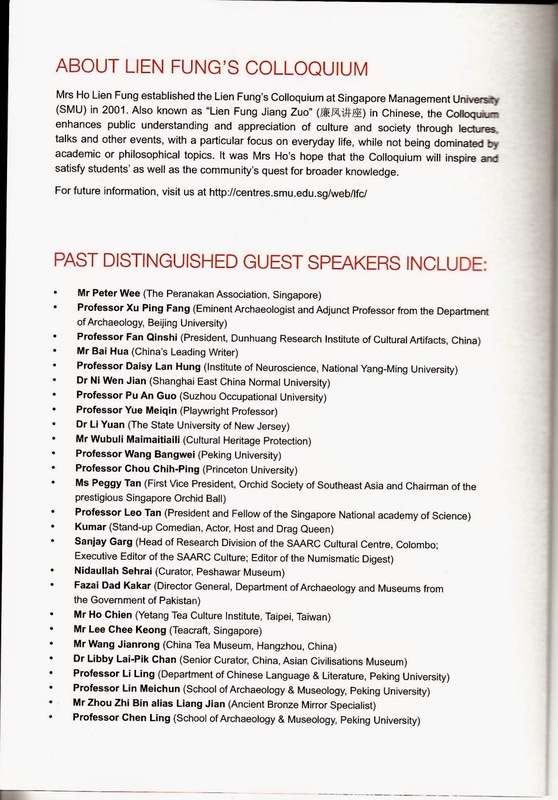 There are 15 segments (on UTube) that covers the entire talk and performance. Anak is still a good music business model for your professional musicians who are trying to make their way in the industry. 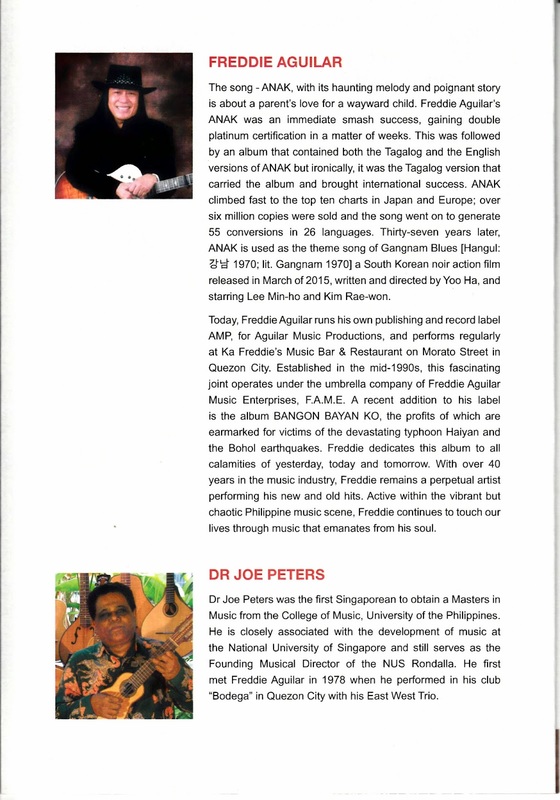 If you are in Manila and want to say hello to Freddie and his son Jeriko, you can visit Ka Freddie Restruant and Bar, where Freddie performs. He has other musicians there too - it like a re-creation of his old University Belt club BODEGA - some forty years ago. Ka Freddie is at 120 Tomas Morato Avenue, Quezon City. 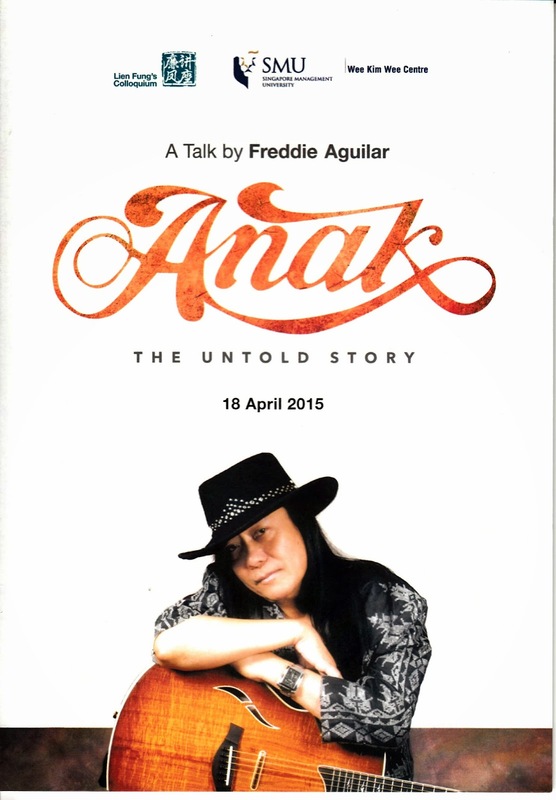 6 Freddie Aguilar's Talk at SMU: Olongapo City Making it Finally! 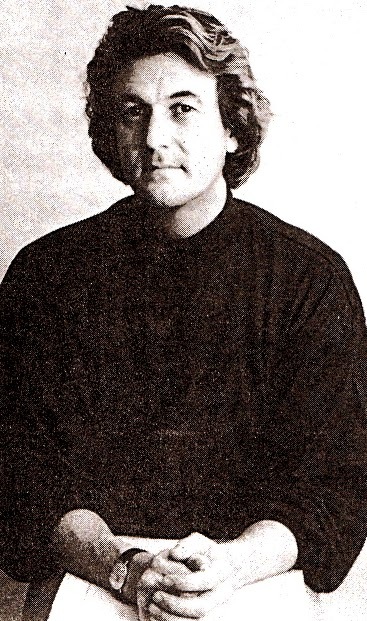 In the 1980s I met Johan De Meij (https://www.facebook.com/johan.a.demeij?fref=ts), then an up and coming symphonic band composer and conductor, on one of my visits to WASBE (World Association of Symphonic Bands and Ensembles). He was riding high because of an exceptional music work for band: LORD of the RINGS! 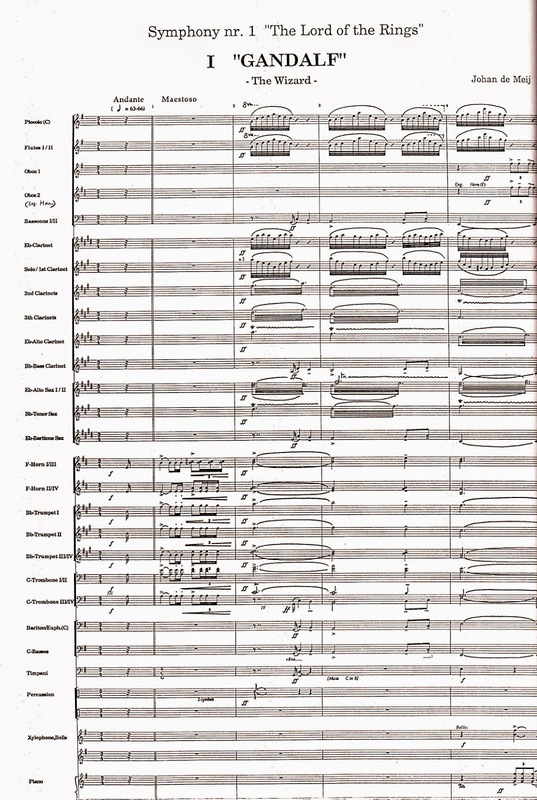 It won the top award in 1989 for the Sudler International Prize for Wind Bands and was published by Amstel. 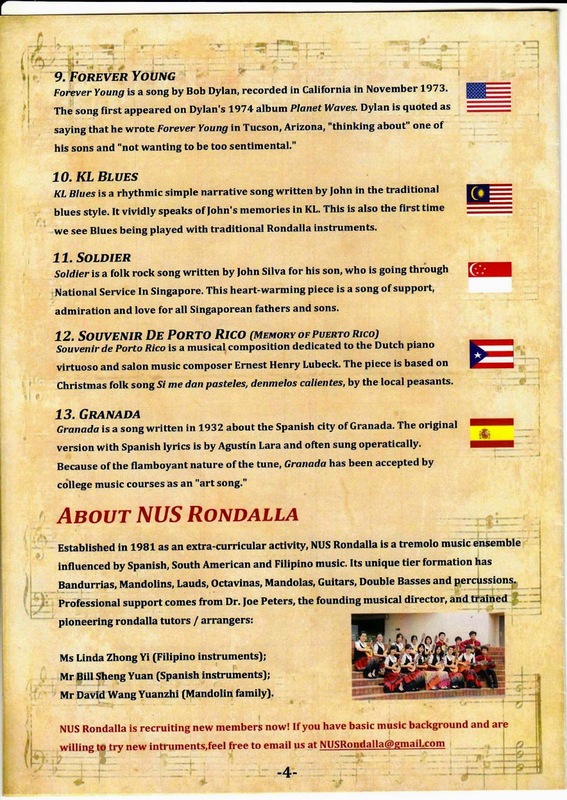 I was then encouraging the NUS (National University of Singapore) Symphonic Band to play these types of works in the band literature in their Intempo concert series. 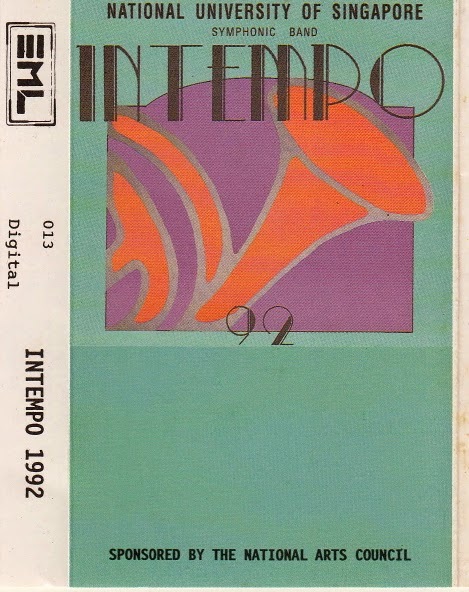 They did that in 1992 and the performance was audio recorded by the EML (Electronic Music Lab). 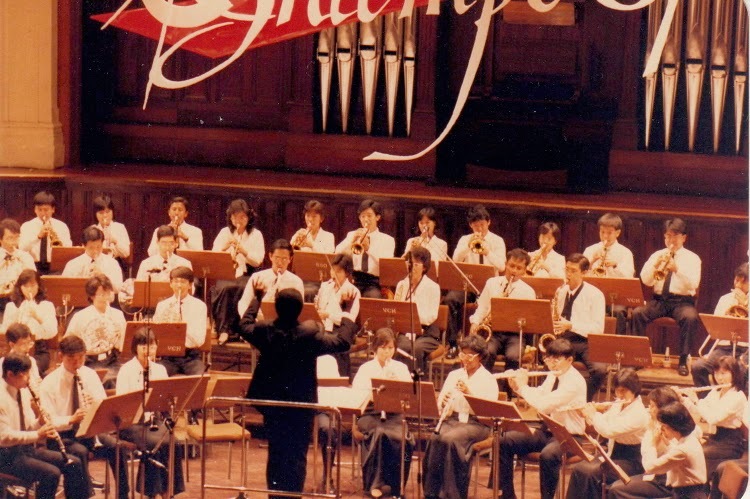 This work was a challenge for the NUS Band because they never performed such a long work that covered the entire first half of the concert. Johan is today a role model for band conductors, entrepreneurs and developers all rolled into one. If you follow his Facebook page, he is still active and central to the high quality in the performances and score publication of European band music. 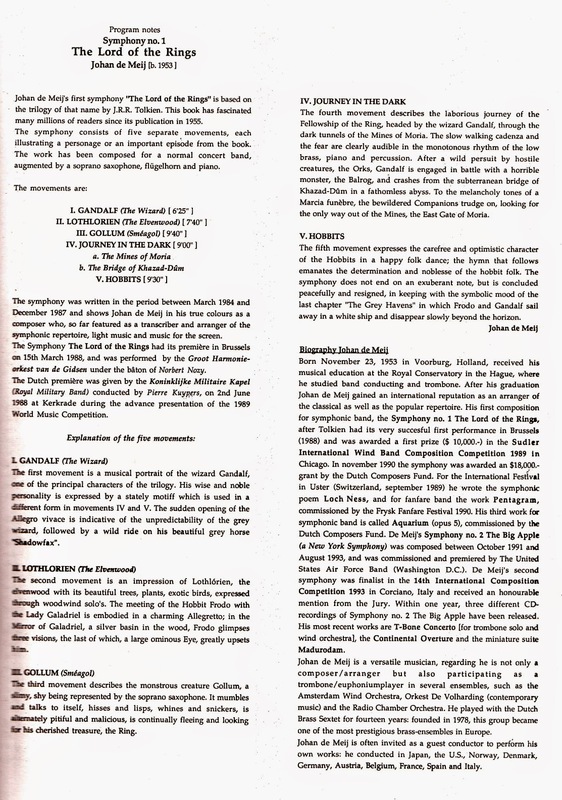 As a tribute to him, I like to present that performance of the work LORD of the RINGs according to the score that was published by Amstel (see above). Between 2000 - 2007 I taught a music elective at the newly established SMU - Music East and West. 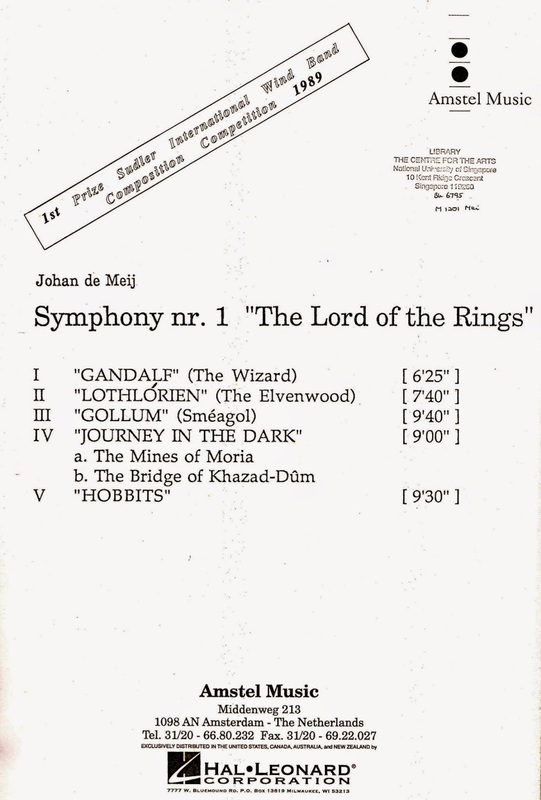 I had a chance to test some of my music pedagogy ideas within a music laboratory that focused on students deconstructing music works like the Lord of the Rings and doing objective lay-persons commentary directly to the music timeline. Back then much technology had to be configured to enable this. 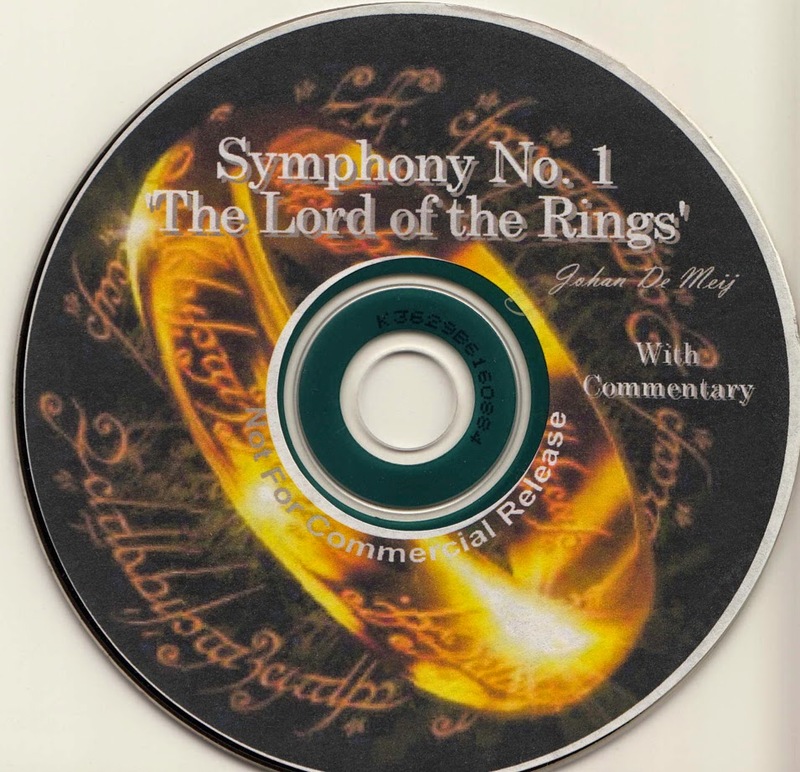 A team of students took up the challenge to do their analysis and timeline music commentary on Johan Di Meij's Lord of the Rings.